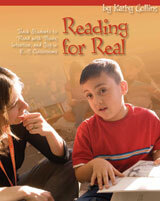 Learn to plan for independent reading workshops in your own classroom. This book explores the structure of such workshops and other components of a balanced literacy program that work together to ensure young students grow into strong, independent readers. Chapters are devoted to individual units of study for the whole year, and include a sample curriculum as well as examples of mini-lessons and reading conferences. A series of planning sheets and management tips are presented throughout to help ensure smooth implementation.